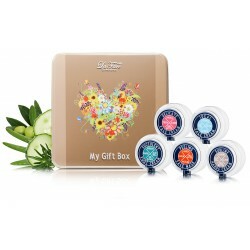 My Gift Box There is 1 product. + 1 Organic Sublime Hands Cream 30 ml / 1 fl.oz + 1 Organic Succulent Foot Cream 30 ml / 1 fl.oz + 1 Organic Peeling Face Mask 30 ml / 1 fl.oz + 1 Organic Ideal Face Cream 30 ml / 1 fl.oz + 1 Organic Delicate Face Cream 30 ml / 1 fl.oz My Gift Box is the gift that (you) will fill from head to toe! A offer and to offer ! Dermatologically tested.